Does your office allow dogs? Even better than that, does your company fully embrace the idea of a dog-friendly workplace? 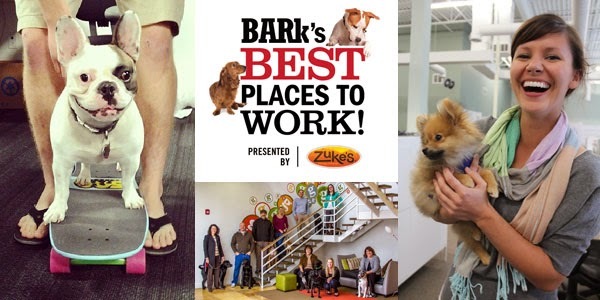 Here's your chance to enter Bark's Best Places to Work presented by Zuke's, the annual search for the most dog-friendly workplaces in America. Entries will be accepted online until October 31, 2014 at midnight. Contest details, rules and entry form are available here. Three winning companies will be featured in Bark's Spring 2015 print magazine and each of their office pups will receive a year’s worth of Zuke’s dog treats! with healthy office snacks from Zuke's! We love the idea of dogs in the workplace and there's plenty of good reasons for companies to embrace a dog-friendly culture. Studies confirm that dogs reduce anxiety and stress, helping to lower blood pressure and other health risks. Dogs help build office camaraderie and bridge social connections. They act as great exercise companions, and keep energy levels high. CANINE-FRIENDLY CAMPUS: Does your company offer inviting, safe workplaces that pay special attention to the needs and well-being of company dogs, offering a dog workers paradise? DOG-DRIVEN WORK POLICIES: Does your office value thoughtful, progressive pet-policies—fair and balanced for both humans and dogs. DEDICATED TO CANINE CAUSES: When it’s time to donate resources to a cause, does your company unleash the hounds? The Bark and Zuke's want to know about companies who go above and beyond to assist animals in their community. Want to learn more about how to make your office dog friendly? 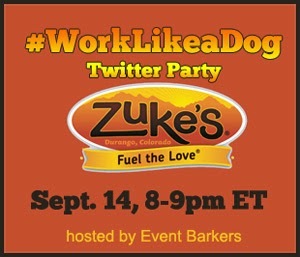 Join us at the #WorkLikeaDog Twitter Party with @ZukesPets on September 14, 8-9 p.m. ET! There'll be lots of fun and, along with co-hosts DogTipper and All Things Dog Blog, we'll be giving away more than $750 in prizes from Zuke's and The Bark. RSVP and enter our pre-party giveaways on our Twitter Party announcement post. And please be sure to take a photo of your dog “at work” and share it as an entry method on that page, too! During the party, we’ll be sharing photos of dogs working –whether that work is fetching their favorite toys, exploring a new trail, or helping you brainstorm at the office! Hope you join us at #WorkLikeaDog! 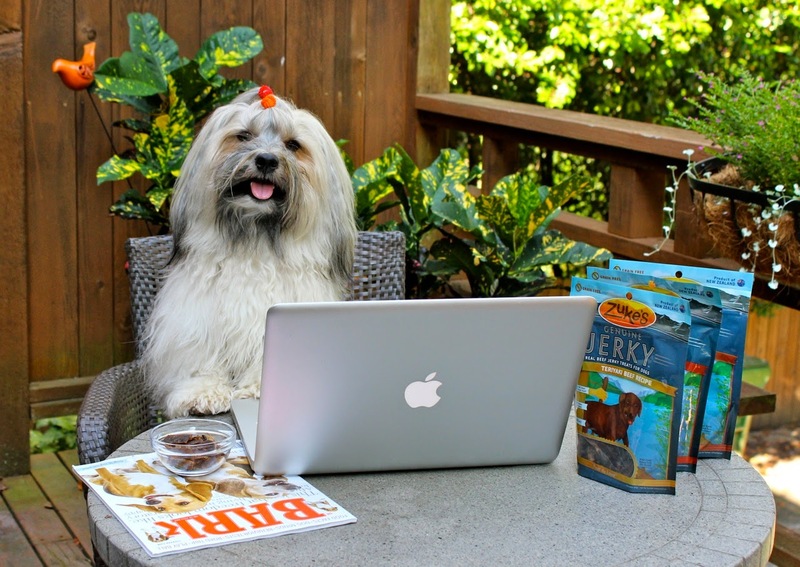 We are working with Zuke’s through our partnership in Event Barkers to produce the #WorkLikeaDog Twitter party and share product news with our readers. Prizes will be provided and shipped by Zuke’s. At To Dog With Love, we only share information we believe in. All opinions expressed herein are our own. That sounds like a lot of fun! Mom works at a grooming and doggie daycare so they are totally pet friendly! BOL! Can't wait to see who the winners are! What a great idea and we think more companies should allow pets join their owners in work where they can. Have tremendousThursday.